Galissas is the most popular tourist resort of Syros, located in a protected bay on the west coast of the island. It includes an area of 7700 acres together with Danakos, a small and quiet farming settlement, the two villages together numbering 500 inhabitants. Galissas includes both arable land used for farming as well as rocky land used for herding. Photo: View of the main beach of Galissas from Agia Pakou hill. 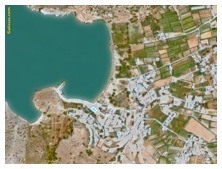 The people of Galissas engage in farming, agriculture, commerce and tourism. There is a substantial tourist growth the last 20 years, converting the area from primarily agricultural to the most popular tourist resort of Syros. Galissas Accommodation. Lodging in Galissas includes numerous hotels and rooms for rent, some with a swimming pool, and a camping site, all within walking distance from the main beach of Galissas. In Galissas, there are taverns, cafes, bars, various retail shops, such as mini-market, apparel, souvenirs for tourists, jewelers and a hair salon. 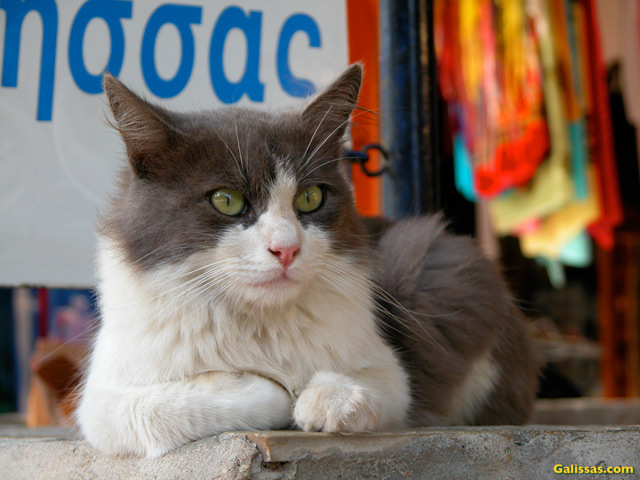 Photo: Errikos, the mascot of Galissas. The main Galissas beach is long, with shallow-waters, and lined with tamarisk trees and has been awarded the blue-flag by the EU. Visitors can engage in various water sport activities as well as mini-golf. There is also the quiet, small beach of Armeos in Agia Pakou bay, popular with nudists, with no shops or any other tourist infrastructure. It is about 10 minutes way on foot, by going up the steps to the church of Agia Pakou and then walking down to the beach. Alternatively, it is accessible by water bike or canoe from the main Galissas beach. 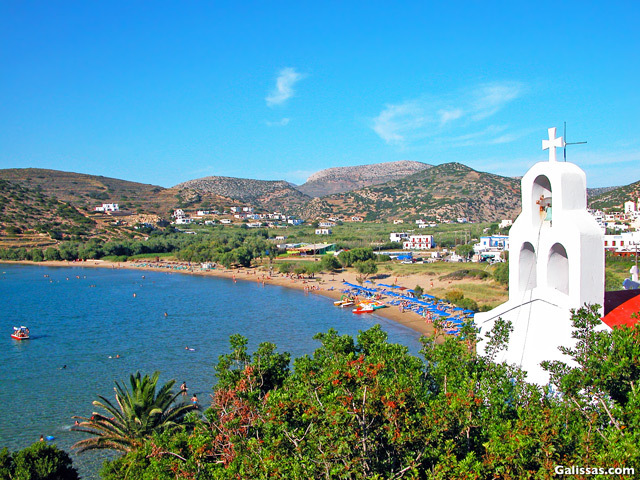 Area landmarks are the hill and church of Agia Pakou, the small harbor with a quaint stone pier, the beach of Armeos, the large cave of Agios Stefanos with the water springs, as well as the chapels of Agios Mamas and Agios Kyrikos, the oldest church in Syros. The main church of Galissas is the Catholic church The Sacred Heart of Jesus Christ. 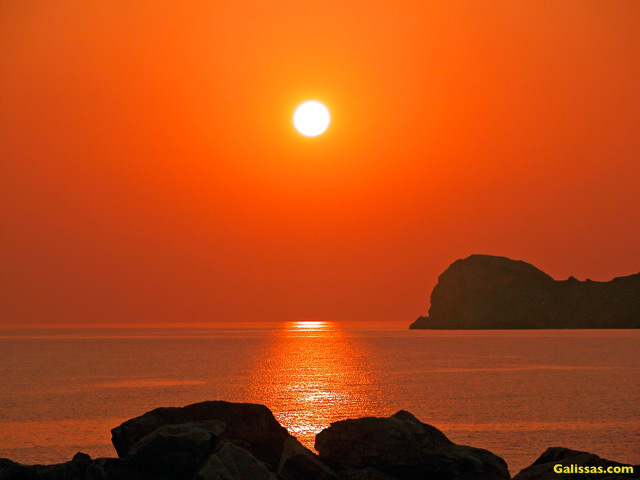 Photo: Sunset across the bay of Galissas. Historians claim that Galissas was settled in the 8th century B.C., with small settlements such as Katacephalos, Harassonas, Horafida, Halepa, Agia Pakou, Argeuto, and Kaveiri. King of the settlement was Prineus the Galissios, hence the name of the village: Galissas. 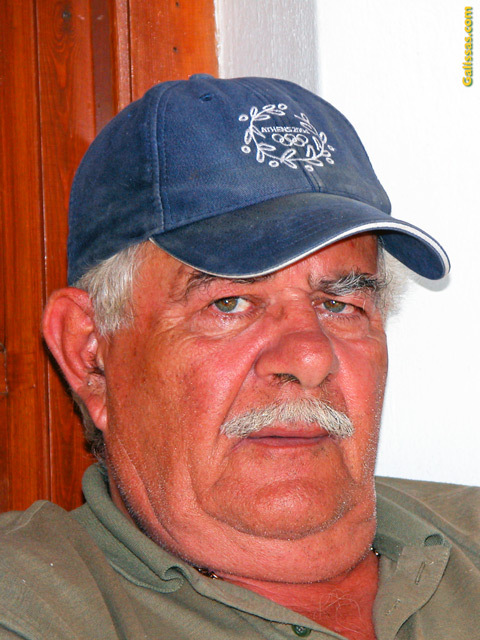 Photo: Antonis Vamvakaris, proprietor of Maistrali Hotel and a fine woodcraftsman. Mr. Vamvakaris is a nephew of the late Markos Vamvakaris, the famous singer of "Frangosyriani", a classic song of the "Rembetika" genre that includes a poignant reference to Galissas, Syros. The name is probably derived from the Greek word for "Obedience". It features a quiet, small beach, with no shops, popular with nudists. It is about 10 minutes way on foot, by going up the steps to the church of Agia Pakou and then walking down to the beach. Alternatively, it is accessible by water bike or canoe from the main Galissas beach.